Whether you’re traveling the U.S. or living as a permanent resident, finding the best Belgian waffle restaurants on the East Coast is as much a matter of authenticity as it is of innovation. The high-traffic hustle and bustle of the Northeast and dense population of major cities make the East Coast food scene top notch and diverse. Local food competition is fierce, and the end result is a wealth of delicious waffle options that cover traditional street recipes to high-end remakes of a classic favorite. Here is our list of the top eight best Belgian waffle restaurants, cafes, and food trucks on the East Coast. Don’t let the sign fool you: this isn’t a mussel bar. St. Arnold’s at Cleveland Park offers a sturdy selection of Belgian Liege Waffles. You can find them on their brunch menu, each of which comes with one of several classic toppings. Choices include fruit and whipped cream, powdered sugar, chocolate sauce, Nutella, or honey. 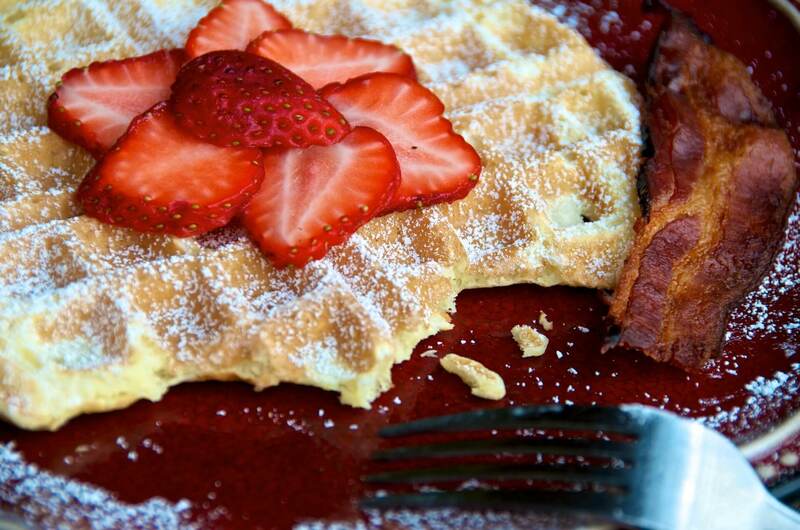 An understated topping selection highlights the essential quality of the liege waffles. St. Arnold’s offers waffles in the savory category. The Waffle Burger: a juicy house burger sandwiched between two liege waffles. Additionally, their Ghent-inspired Wafflezooi combines the liege waffle with a traditional waterzooi stew. Leave it to Ball Square Cafe to make the Belgian waffle seem like a health statement: their traditional Delight waffle comes with a mound of fresh fruit and homemade whipped cream that is both visually appealing and delicious. Other topping combinations include fresh or caramelized banana, strawberries, blueberries, kiwi, melon, or walnuts. 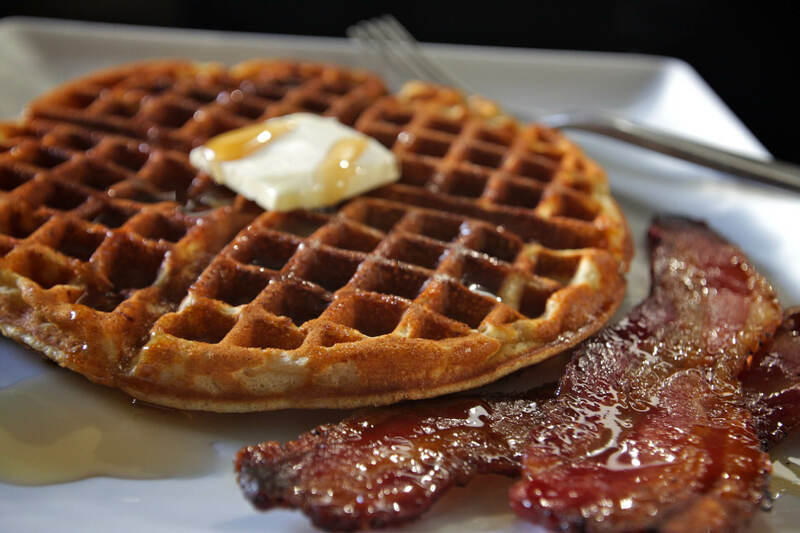 In addition to their regular Belgian, they offer sugar-free syrup and gluten-free and multi-grain waffles for those with dietary restrictions. What’s even better? They serve their breakfast menu until 3:00 p.m. every day! Specializing in soups, waffle sandwiches, and sweet gluten-free options, the Wicked Waffle has adapted Belgian tradition to meet the needs of the modern diner. Their minimalistic European approach excludes butter and syrup while the wholesome ingredients in their batter produce fluffy, crisp gluten-free waffles. They serve unique assortment of savory waffle sandwiches, including the waffle-laden Tuna Melt, Ham and Cheese Croque Monsieur, Tomato Mozzarella, and more. If you’d like to take the traditional sweet approach, the Wicked Waffle menu also includes a highly curated assortment of sugary options, including the Nutella Banana Waffle, Tiramisu Waffle, Strawberry Shortcake Waffle, or a classic Sweet Waffle with powdered sugar. Aside from its adorable interior, the Magnolia Bistro presents a creative menu that offers multiple gluten-free and vegan options, healthy dishes, and downright fabulous indulgences. However, the real show-stealer is their Belgian Lime Waffles, which are topped with fresh fruit and served with a zest of fresh lime to help you start the day. Set within the vibrant foodie culture of Philly, Green Eggs Cafe holds up against its competitors for its high quality ingredients, low price, and imaginative twists on traditional favorites. The renowned Green Eggs brunch menu does staple items well, including the Classic Belgian waffle with optional toppings of fresh berries, peaches, bananas, cinnamon apples, berry compote, strawberry coulis, vanilla sauce, chantilly cream, chocolate chips or ice cream. However, the waffle that really steals the show is the Chicken and Waffles Benedict, which combines fluffy Belgian waffle with Southern fried chicken, and comes topped with poached eggs and specialty sage hollandaise sauce. This dish rivals all other chicken and waffles pairings, and will absolutely leave you reeling. 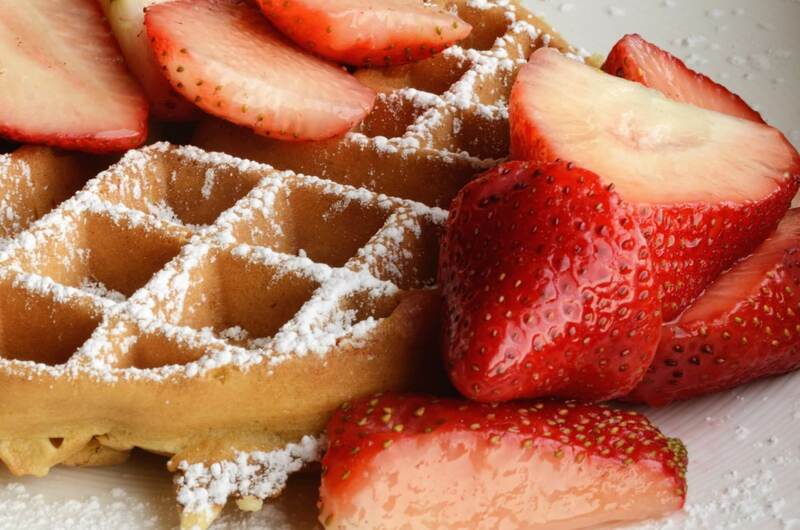 Petite Abeille prides itself on producing traditional Belgian cuisine, which means the Belgian waffle is a staple item in their breakfast menu. Aside from the more classic choices like the Liege Waffle and sugar waffle with strawberries, Petite Abeille adds its own twist to the Belgian Waffle with several handcrafted pairings. For example, the “Oreo” combines vanilla ice cream, chocolate sauce, whipped cream, and oreo cookies to create a delectable topping. The “Banoffee” adds dulce de leche, bananas, whipped cream, and toasted almonds to an impeccably delicious Belgian waffle. For a high-end Belgian meal, look no further than the Belga Cafe. Head chef and Belgium native Bart Vandaele brings expertise and passion into recreating classic Belgian dishes, and the waffle (or wafel) is one of them. All menu items are called by their proper Belgian name, adding to the authenticity of the restaurant’s offerings. If your Dutch isn’t up to par, don’t worry: there are plenty of helpful descriptions in English. Belga makes the traditional Liege waffle into an art form with fresh fruit, whipped cream, apples and cinnamon, or sugar syrup. On the other hand, if you’re feeling adventurous, Chef Vandaele makes a number of savory waffle dishes using eclectic ingredients such as goat cheese, cornbread batter, rosemary, and crab meat. This food truck has a reputation for a reason! Its unwavering commitment to the Waffle and all things Belgian makes it a clear choice for the #1 spot. From daily challenges to weekly specials, Wafels and Dinges is an experience marked with delicious food and exciting choices. From the Liege to the Brussels, their sweet and savory waffle and toppings selection offers something for every palette. You won’t leave disappointed.